In this question and answer Andrei talked about the prospects of the new MHL and about some of the league's future stars... MHL hockey thanks Andrei for his time and for giving us this excellent reading. - Honestly, I don't even know the answer to that question myself. I guess, it's just because I love hockey in general. It really doesn't matter if that’s a pee-wee tournament or an NHL exhibition game we're talking about. Hockey has been in my life for so long that, in fact, it is my life. And I love every single part of it. - Talking about the newly-formed MHL, what do you think about its creation? Which prospects it can offer to Russian junior players? - Obviously it's a great improvement for Russian hockey. It's a huge step forward. We had too many players that would quit hockey just because there was no league for them to play in. You can't on that everybody is going to be as good as Malkin or Ovechkin, right? It's never going to be this way. Let's say you're 18 years old. You don’t play for your hockey-school team anymore. Yet, you can't make the roster neither of the big team like CSKA or Ak Bars, nor of it's farm-club. It's just way to competitive at this level. So what are your options? The easiest would be to quit. You can't blame those guys. They've got to do something with their lives and let's face it – hockey's a tough business. Now, on the other hand, you got the MHL where you actually can play and get a chance to improve. - Do you think the creation of the MHL will prevent junior players walk towards the CHL? - No, I don't think so. And let me explain why. If you look at the guys who went overseas to in the CHL, you can easily notice that they are pretty talented. You don’t see an average Russian junior playing in the OHL or QJMHL, do you? All the players that were drafted by CHL teams were the best Russian juniors at that particular time. Look at the recent draft results – Burmistrov, Kabanov, Pivtsakin… These guys won silver medals at the latest U-18 World Championship. And the list goes on. Are they going to play in Canada? Well, if they can't make to the KHL, most likely, yes, they are. Why's that? I have to say that the level of the MHL is not going to be as high as the CHL. So, in a nut-shell – the MHL is a good thing for an average player, but could easily turn out as a step-back for the best juniors there are. - You surely have seen the first MHL logos revealed. Which one do you like the most? - Yes, I did see the first logos that came out. To tell you the truth, there's only one that I really like. The one Sibirskie Snaipery got. This thing looks amazing. I sure hope the team itself is going to be just as the logo. - The first MHL fotosession featured Alexander Avtsin from Dinamo, Aleksandr Khokhlachev from Spartak, Alexei Marchenko from CSKA and Arseni Kardailski from Atlant. But surely there will be other interesting players. Can you tell us some names? Do you think Ainars Podzins might be one of them? - I'd be really happy if Ainars, who's a good friend of mine, would play in the MHL. Actually, I think he'd be one of the best in the league. But the thing is, his team has yet to confirm its participation in the upcoming season in the MHL. If not, he's going to play either in Vyschaya Liga or Pervaya Liga, which might be a good experience. Especially if Alexei Kasatonov will promote him to the main team of Krylia Sovetov. This way he'd be playing against older opponents, which is definitely way better for his development. As for the other names, I'm pretty sure that Eugeny Grigorenko from Stalnye Lisy is going to be a huge star of the MHL as well as his team-mate Bogdan Potekhin. There are a lot of talented players in Krasnaya Armiya and MHK Dynamo. Namely Barbashev, Suchkov, Zotov, Ilminskyi, Fetisov… These are just a few names but then, of course, I can go on all day. - Many could argue that having the MHL teams playing in the same arenas as the main one might be an error as the teams will have around 100 spectators, and they also indicate that the teams should play in city where KHL or Vyschaya Liga aren't present. On the other hand one might feel like the facilities in cities like Kazan, Omsk, and so on, are undoubtfully better than the ones in minor cities. What's your opinion on this matter? - I really doubt that there's going to be a lot of spectators at the MHL games this season. You already answered your own question. MHL teams have to play in different cities. The question is – who's going to pay for all this? For instance, why does Dynamo Moscow have to pay for some other city so just there would be a hockey team? It doesn't make any sense. In North America minor teams are independent and that's the reason of their success. It's a whole different story in Russia. Besides, hockey in general is not that popular in Russia. Of course, there are some hockey-obsessed cities like Omsk or Toliatti but there's not a lot of them. It's Canada where you can throw a puck to bunch of 13-years-old kids and there's going to be a packed arena watching them play. We still have to work to make hockey popular in Russia. Because today, I hate to say it, hockey loses to soccer and by a huge margin. - So now the tough job of the predictions: who will win the first MHL title? Anyone is looking to CSKA, Dinamo and such teams, but the last Russian Finals have been won by Orlov's Metallurg Novokuznetsk. What's your say? - It's funny that you brought it up. I don't even know why did Orlov and Kitsyn played at that tournament. There were on the roster of Metallurg which plays in the KHL. Correct me if I'm wrong but I'm quite sure that KHL players are eligible to play in that kind of tournament. Anyway, I have to say that the favorites are as follows – Krasnaya Armiya, Stalnye Lisy, Loko and MHK Dynamo. I would probably bet on Krasnaya Armiya but I know that there's a lot of MHL players that see the Stalnye Lisy as the main cup contenders this season. I have to add that Almaz should not be underestimated. You don’t talk about these guys now, but let's wait another 2 or 3 months. A lot of people might be surprised looking at the standings. And don't forget it's junior hockey we're talking about here. It's always hard to predict. - Another prediction, maybe a tad easier. On September 4th there will be the first ever MHL match between Krasnaya Armiya and MHK Dinamo. Alexander Avtsin told that their team will grab the win, do you agree with him? - What else do you want to say? That's what he's supposed to say. Personally, I think it's going to be close one but Krasnya Armiya will win eventually. 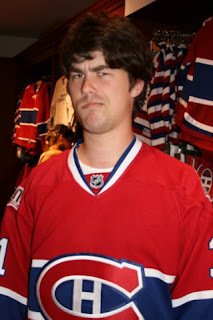 by the way, does Andrei wears a Price jersey?